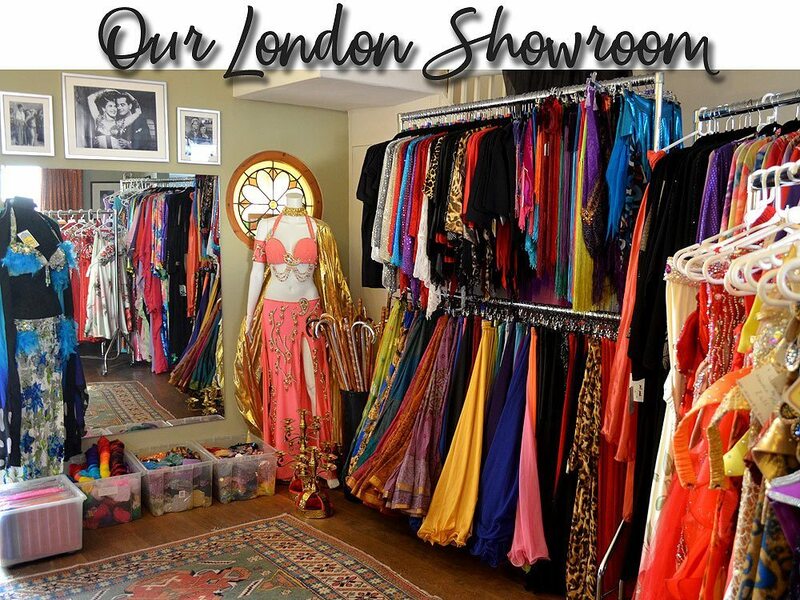 If you live in or around the capital or happen to find yourself visiting London from afar, rather than browse our Online Shop you can now shop in person, by appointment only, at the Bellydance Boutique London Showroom! Had your eye on a Belly Dance Costume online, but wanted to try it on before you buy with no obligation? (Alteration service available.) Our extensive client base includes everyone from beginners to London’s top professional belly dancers and if it’s Props you’re after, our selection is the best. Book in for a fabulous personal shopping experience with expert advice from Krystina, whether you just want a Hip Belt or a stunning Designer Belly Dance Costume with all the trimmings! Please note: Same day bookings are fine but please check with us before popping in as we are often out and about. Bellydance Boutique is an Aladdin’s cave of costumes, props and accessories for bellydance. The range of professional costumes is fantastic with so many beautiful styles in every colour you can imagine and prices to suit all budgets. Chris is very knowledgeable about the latest trends in costuming from Egypt and can point you in the right direction to suit your size and shape. She also has a vast array of gorgeous sparkly accessories and tribal jewellery to finish off your look. I love shopping at Bellydance Boutique! I no longer have to “make do”! As a plus sized student Bellydancer I, to often, have to make outfits and am reluctant to purchase one size fits all items online. An online size 16 always seems to be a real life size 8! I have squeezed into skirts that are one or two sizes to small and felt uncomfortable or embarrassed. But having found Bellydance Boutique I am delighted to say that I could try on each item and he clothes fit!! The service from Krystina was exemplary. She is a belly dancer and is happy to offer advice and understands sizing, flow and style. I will be shopping there again!! Meet Krystina, the Bellydance Boutique owner. Krystina is the owner of Bellydance Boutique and is now a semi-retired bellydancer and teacher of Egyptian style bellydance. When she used to go to Cairo to have private lessons with the top teachers and performers in Egypt she would always bring back some items of belly dance attire for her students. One day she looked around her house and realised she had a lot of stock sitting around and decided to open up an online shop. The shop became so successful that she decided to give up her classes and concentrate on running the Bellydance Boutique. Having been a bellydancer herself and having had her own award winning dance troupe, Krystina is uniquely qualified to give expert advice on all aspects of costuming from the beginner student right up to professional dancers. Her love of belly dance and passion for the stunning belly dance costumes she sells, makes for never a dull moment at Bellydance Boutique! We first started the Bellydance Boutique Online Shop back in Jan. 2011 then opened our London Showroom three years ago and have not looked back since. We’ve had people visiting from all over the world who come and see our belly dance costumes, props and accessories. From Canada to Brazil and from New Zealand to Iceland. We’re constantly extending our range of costumes from well known and up and coming designers from Egypt and this means we have the latest fashions and trends in the London bellydance community.